StompBox Band, turn your iPad into Two Guitar Effect Racks. StompBox Band provides the flexibility to have two effect racks running at the same time combined with the ability to utilize audio interfaces with multiple inputs and outputs. Great for bands on a budget with two separate effect racks for different band members with the ability to output either a mix or separate outputs to your amps. Band Edition includes a Chord Explorer to audition your patches whilst making modifications. Song Mode enables you to save commonly used patches and chords to song files. StompBox Band also has a built in Chord Explorer and Song Mode, allowing you to save commonly used patches and chords to song files. Use the Chord Explorer to audition your patches whilst making modifications. StompBox Band supports AudioBus and Apple’s Inter-App Audio making an excellent general purpose audio processing tool for all musicians, not just guitarists. 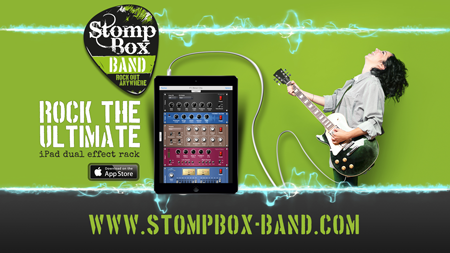 Visit http://www.stompbox-band.com for further details on StompBox Band and the available In-App purchases. Process 2 Effect Racks at the same time. StompBox free turns your iPad into a flexible Multi FX Processor which comes with 3 free effects; Delay, Reverb, Chorus and a further 16 Effects to choose from in the Online store. StompBox Free supports AudioBus and Apple’s Inter-App Audio making an excellent general purpose audio processing tool for all musicians, not just guitarists. Simply listen through a pair of headphones, or attach to an external amplifier or hifi to truly experience the program in all its glory! Once you have built up a library of patches, you can use the virtual foot controller to quickly and easily move between patches. The Virtual Foot controller gives instant access to all patch parameters and amp settings, with the ability to enable and disable individual effects at the touch of a button. If you want to modify an effect parameter, simply scroll the effect rack into view and make your changes. Media Player – Load your favorite MP3s and play along, you can even slow down the music without effecting pitch so you can play along at your own pace. 4 Track Recorder – Record your own backing track. Loop Station – Record your own loops. Many guitar apps use a form of Amp Modelling which in most cases is just fancy form of EQ. This is great for electric guitars, but not so good for accoustic. StompBox allows various amp EQ’s both via the PreAmp and additional effects, but the important thing for accoutic guitar users is that these EQ’s can be completely bypassed. 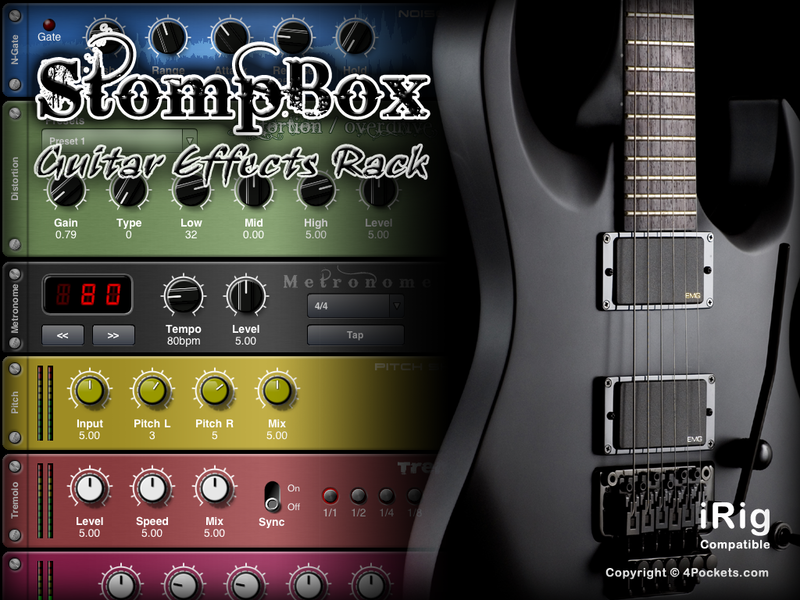 This is where StompBox really shines, giving a faithful reproduction of accoustic instruments. This also means StompBox can be used on keyboards too. 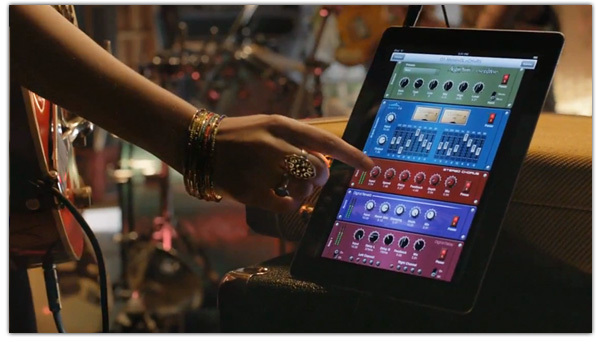 StompBox Multi FX App for the iPad now supports Apple’s Inter-App Audio. Making it an excellent general purpose audio processing tool for all musicians, not just guitarists. StompBox turns your iPad into a flexible Multi FX Processor which comes with 16 effects plus a 4 Track Recorder and Media Player. Simply listen through a pair of headphones, or attach to an external amplifier or hifi to truly experience the program in all its glory. AudioBus and Apple Inter App Audio Compatible. Showcase your skills using a Guitar, iPad and 4PocketsAudio’s StompBox Guitar Effects App and win some great prizes in our biggest ever competition. StompBox turns your iPad into a fully fledged digital effects unit, complete with chromatic guitar tuner, metronome and loop recording tools. It was featured by Apple in the 2011/2012 “Love” iPad TV Commercials. The pioneers in mobile music making now bring you the new iRig HD – the next generation of the immensely popular AmpliTube iRig interface. 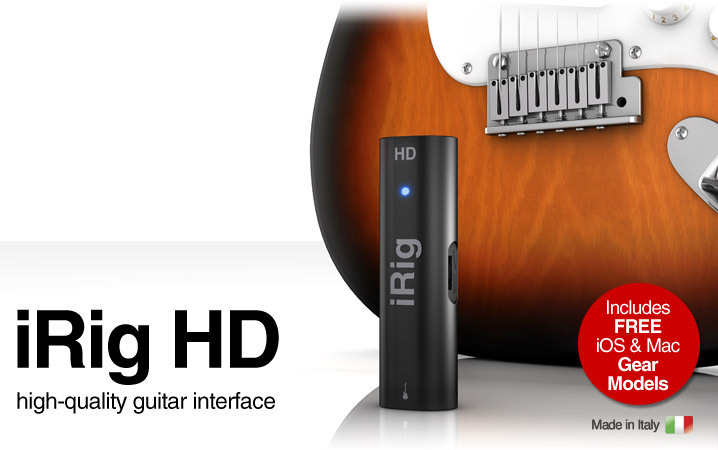 iRig HD is the first high-quality 24-bit audio interface that fits in your pocket and connects directly to your Lightning, 30-pin and USB devices – so no matter which iPhone, iPod touch, iPad or Mac you have, you’ll rock out in seconds. Welcome to the 4Pocketsaudio Interview for September, we are very pleased to be joined by Marcos Kleine an internationally recognised Guitarist, Award Winning Film Composer and Music Producer. Marcos has been a member of a number the highly successful bands including Vega, heavy metal band Exhort and more recently Ultraje a Rigor. As a producer Marcos is working with acclaimed Brazilian acts such as journalist turned singer Celso Cardoso. Marcos is also known in Brazil for his passion for SE Palmeiras soccer club, he is also a favourite of their fans for his live guitar version of the clubs anthem. I would like to thank Marcos for taking the time to do the interview, as my Portuguese consisted of being able to order a large beer Marcos kindly agreed to do the interview in English, so thanks to Marcos on both counts. So on with the interview. Q. You are a talented musician on several instruments so what made you focus on the Guitar. A. When I was 10 years old I had an affair with drums, but at that time I lived in an apartment and I would never have money to buy a set. So I played drums everywhere, pillows, sofas, it was fun and my first experience playing in a real drums was at 14 years old. Q. Who are your guitar hero’s and inspirations. A. My first “guru” was Randy Rhoads. I tried to play all the solos from the Ozzy Osbourne songs. I am also huge fan of Jeff Beck, Stevie Ray, Brian Setzer, Robben Ford, David Gilmour, Jimmy Page and of course Jimmy Hendrix. Q. You seem to be incredibly busy how do you find the time to perform with Ultraje a Rigor, produce and your film work. A. Wake up early, optimize my time and discipline. At the moment all my focus is on Ultraje a Rigor, but I still have some little time to do productions, soundtracks etc..
Q. There are a number of videos of you using an iPad in gigs, do you see a trend of more musicians using iPads. A. I love to use iPad in rehearsals, it’s amazing. I never imagined in my life be able to use this kind of equipment. I lived in a time that was difficult to get a good guitar, amps and stomps. Especially in Brazil were we pay 3x more for anything that comes from abroad. I think the iPad is something that will change the way we play and practice our instruments. I can see as the iPad becomes more a more established piece of equipment for musicians that we will put on gigs with 3k of equipment instead of a truck full of amps and pedals. Q. As a regular user of StompBox for the iPad, how do you find using the iPad instead of traditional effects units. Q. A lot of guitarists have names for their guitars, Brian May has Red Special, do you have names for your guitars? A. Yes, my white one is called ANE, from “ANEMIA”, I think I don’t need to explain why heheh. Q. I know you are a big fan of Star Trek and have done guitar versions of the Star Trek themes and composed tracks for the spoof cartoon Sev Trek so what message would you send to JJ Abrahams to persuade him to let you to do a track for the next movie. A. Ok, I will be honest! Q. What’s next for Marcos Kleine? A. I never know what is coming next, but I hope I can have health and strength to keep working, I love music and to play guitar. This is my life since I was 15! I am also thinking about recording 6 more instrumental songs to release an instrumental album. Ultraje is in a great place at the moment, we are the band of the late show Agora é Tarde and this is a great experience. Soon I will be working on a soundtrack for a movie and a new cartoon project. But the details are secret for now hehehe..
Q. The 2016 Olympics will be held in Rio, knowing your love of sport how much would it mean to you to play at the 2016 Olympic Opening Ceremony”. A. I would be honoured if I am asked, but I think it will be easier for Brazil to beat China or USA in the medal table than someone on the Olympic committee invite me to play. All the indications are that Samba will be the soundtrack of the Olympics, but I would it would be a great honour to play at my home Olympics. StompBox Guitar Effect App for iPad that featured in Apple’s “Love iPad’2 TV Commercial has been reduced from $19.99 to $9.99. The new Milos Twilight movie Gothic Assassins due for release shortly has a soundtrack entirely composed on Apple iPad’s and iPhones. Whilst many might have branded Milos as mad when they first heard his concept for creating his soundtrack check out some of these tracks to see just what he has accomplished. 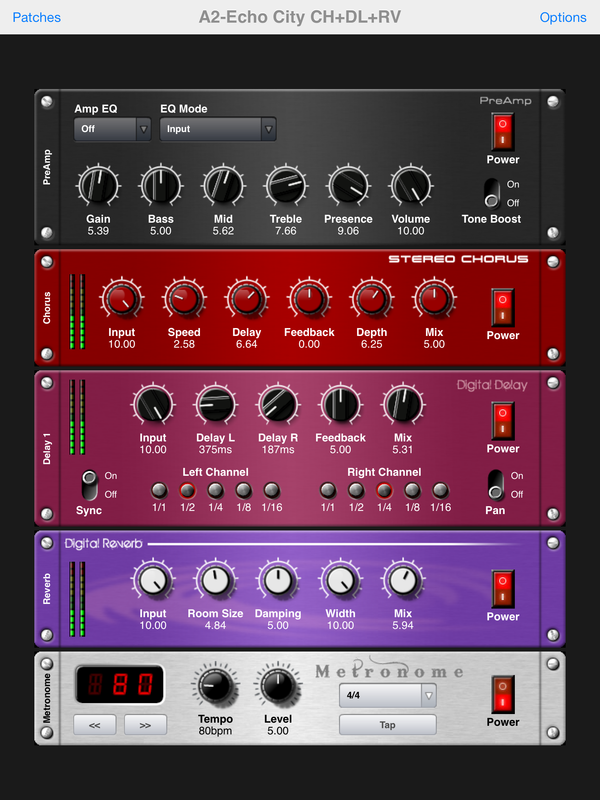 Milos used a range of apps including Meteor Multitrack Recorder, Aurora Sound Studio HD and StompBox.